Miscarriage occurs in approximately 15% of all clinically recognized pregnancies, and is one of the most common reproductive complications in human . In addition to chromosomal defects, uterine abnormalities, endocrine disorders, thrombophilia, and infection, maternal immunological aberrations are considered to play an important part in contributing to miscarriage. Maternal immunological recognition of the semi-allograft conceptus is pivotal to the maintenance of gestation . In this maternal immune response at the feto-maternal interface, the dominant cytokine response characterized as T helper type (TH) 2 is generally considered to protect the embryo from immunological rejection, whereas a shift to the pro-inflammatory TH1 response is associated with reproductive failure [3, 4]. Decidual stromal cells (DSCs), which are the primary component of decidual tissue, have been implicated in this tolerogenic and anti-inflammatory microenvironment . Emerging evidence has shown that DSCs secrete several cytokines and chemokines to modulate the TH2 shift and to orchestrate the immune tolerance at the feto-maternal interface . Although being permissive to the presence of embryo, the intrauterine immune system also responds immediately to defend against invading pathogens at the same time . Toll-like receptors (TLRs), which are a highly conserved family in invertebrates and vertebrates, form the majority of pattern recognition receptors (PRRs) involved in the innate immune response against infections . Among the TLR family, TLR4 was the first to be identified . In addition to being localized in immune cells, TLR4 is abundantly expressed in non-immune cells at the feto-maternal interface, including trophoblasts , decidual epithelial cells (DECs)  and DSCs . TLR4 transduces signals from gram-negative bacterial toxin lipopolysaccharide (LPS) and subsequently activates nuclear factor-kappa B (NF-κB) to induce the expression of pro-inflammatory cytokines . Nevertheless, studies have reported that overactivation of TLR4 activities may play a role in the etiology of recurrent pregnancy loss (RPL) . LPS is known to initiate innate immune responses through TLR4, and LPS administration to rats during early pregnancy has been shown to trigger TLR4 activation leading to poor early placentation , while neutralization of LPS or interrupting the TLR4 signaling has been shown to abrogate fetal loss in murine pregnancy . Serum-glucocorticoid regulated kinase (SGK) 1 is a target of the LPS/TLR4 signaling cascade . SGK1 is a serine-threonine protein kinase belonging to the protein kinase A/protein kinase G/protein kinase C (AGC) family , and is activated by the phosphoinositide 3-kinase (PI3K) signaling pathway [17, 18]. SGK1 gene expression is up-regulated during early pregnancy . SGK1 activity and expression are both suppressed in the midsecretory endometrial stromal cells of women suffering from RPL, which sensitizes these cells to oxidative cell death . This down-regulation of SGK1 has been reported to inversely correlate with miR-199b-5p up-regulation in the decidua of patients with early spontaneous miscarriage, and this correlation was validated in the CBA/J × DBA/2 mouse model of miscarriage . Nevertheless, the mechanistic underpinnings of SGK1 down-regulation associated with pregnancy loss are not completely understood. One recent study found that E2-induced SGK1 over-expression inhibited apoptosis to promote the survival of stromal cells in ovarian endometrioma cyst walls . E2 has been suggested to influence different immune cell populations . The delicate interaction between E2 and TLR4 is heavily implicated in immune cells in vivo [24, 25]. However, the intricate cross-talk between E2 and TLR4 signaling at the feto-maternal interface remains elusive. As E2 exhibits both pro- and anti-inflammatory properties , there is still a wide gap in our understanding of this pregnancy hormone in TLR4-triggered innate immune responses that could be pernicious to the successful pregnancy maintenance. Here, we aimed to study the biological roles of SGK1 and its upstream activator E2 in early pregnancy and their roles in spontaneous miscarriage. To this end, we examined the serum E2 levels and determined the SGK1 expression levels in the decidual tissue retrieved from women who had early spontaneous miscarriage and from women with normal pregnancies. We further analyzed the regulative actions of SGK1 and its downstream targets on DSCs at the feto-maternal interface. Considering the critical roles of E2 and progesterone (P4) in predicting the odds of a live birth, we initially sought to examine whether serum E2 and P4 concentrations were associated with early miscarriage. We found that the serum P4 concentrations (Figure 1B) were similar between normal pregnancies and miscarriages during early gestation, whereas the concentration of serum E2 (Figure 1A) was considerably lower in failed pregnancies than in the clinically normal pregnancies. Similarly, the SGK1 mRNA levels were also lower in the decidual tissue of the miscarriage group than in that of the normal pregnancy group (Figure 1C). These results were validated by the results of the Western blot analysis, which showed that both total (t-) and phosphorylated (p)-SGK1 protein levels were lower in the miscarriage group than in the normal pregnancy group (Figure 1D). Moreover, the ratio of phosphorylated SGK1 to total SGK1 (p/t) SGK1, which represents activation of the kinase, was notably lower in the decidual tissue from miscarriage than that from normal pregnancy. Results of the immunohistochemical analyses (Figure 1E and F) revealed that SGK1 was heavily expressed in decidual tissue. Results of the laser scanning confocal microscopy revealed that SGK1 was localized to the decidual stromal compartment (Figure 1G). These results indicate that the low serum E2 concentration during the first trimester and the down-regulation of decidual SGK1 are correlated with early pregnancy loss. Excessive TLR4 activation triggers an abnormal maternal immune response, leading to fetal rejection [14, 27]. At the feto-maternal interface during human pregnancy, TLR4 is expressed by immune cells, as well as trophoblasts and DSCs . Studies have investigated trophoblasts extensively; however, there are relatively few studies directed at DSCs by comparison. Here, we use LPS to mimic the host immune response against infection. We utilized DSCs, the most prevalent cell population in the decidua, to detect the involvement of E2 and SGK1 in early pregnancy. DSCs were confirmed by detecting vimentin-positive and cytokeratin 7-negative cells by immunofluorescence analysis (Figure 2F). LPS-treated DSCs exhibited suppressed proliferation (Figure 2A) and increased apoptosis (Figure 2B). The apoptosis was further evidenced by the reduced expression of pro-survival genes B-cell CLL/lymphoma 2 (BCL2) and X-linked inhibitor of apoptosis protein (XIAP) in LPS-treated DSCs (Figure 2C, D, and E). 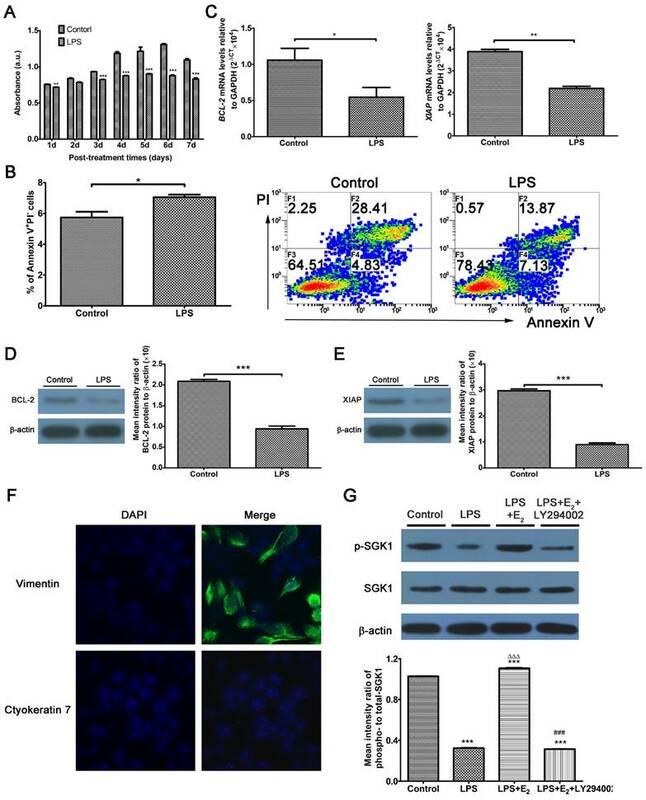 These findings demonstrate that LPS-induced activation of TLR4 signaling leads to a pro-inflammatory and pro-apoptotic intrauterine microenvironment, which was not conducive to the maintenance of gestation. E2 is commonly used to rescue outcomes in women with threatened miscarriage  and it has been postulated to reduce apoptosis and promote growth of DSCs in early pregnancy . Therefore, we wondered whether the maternal E2 protects DSCs from LPS-stimulated apoptosis. We then probed the roles of E2 and SGK1 in early miscarriage which would be caused by excessive activities of TLR4 signaling. As illustrated in Figure 2G, phosphorylated SGK1 levels were reduced in LPS-stimulated DSCs. This reduction was reversed by preincubation of the DSCs with E2. E2 significantly elevated p-SGK1, t-SGK1 and p/t-SGK1 levels in DSCs (Supplementary Figure S1 A and B), while these effects could be abrogated by the estrogen receptor (ER) antagonist ICI182780 or the ERβ antagonist PHTTP but not the ERα antagonist MPP. Moreover, small interfering RNA (siRNA)-mediated ESR2 (gene encodes ERβ) knockdown showed that E2 up-regulated SGK1 activity in DSCs (Supplementary Figure S1 C, D and E). As SGK1 protein is phosphorylated via signaling involving PI3K , we used the specific PI3K inhibitor LY294002 to suppress PI3K signaling. Subsequently, inhibition of PI3K was found to abolish E2-induced phosphorylation of SGK1 in LPS-stimulated DSCs. These data indicate that E2 would activate downstream SGK1 in DSCs via the PI3K signaling pathway. Considering its high expression in tumor cells, SGK1 has been implicated in the cell survival pathways . 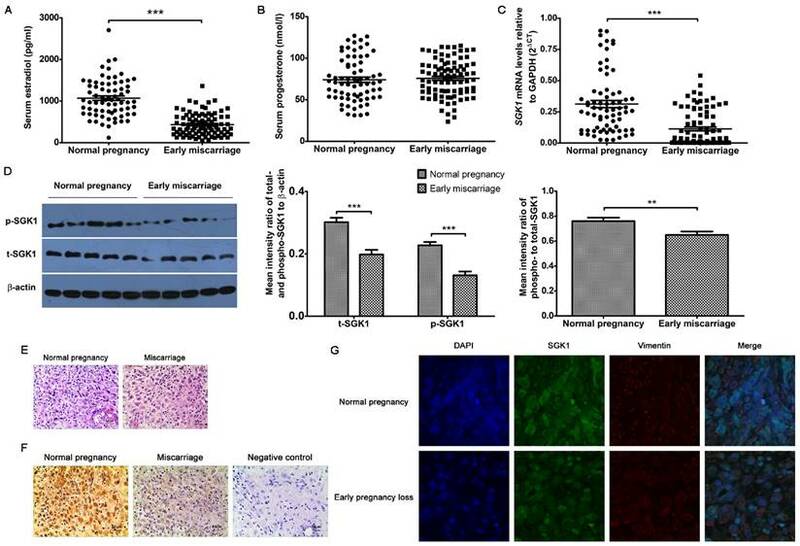 The SGK1 transcript and protein levels were substantially lower in the miscarriage group than in the normal pregnancy group, and pre-incubation with E2 attenuated the LPS-induced apoptosis of DSCs (Figure 3A and B). Based on these results, we next determined if these reactions of LPS-stimulated DSCs upon E2 pretreatment was mediated by SGK1 activation. We found that the pharmacological inhibition of SGK1 with 10 μM GSK650394 substantially reduced cell viability (Figure 3A) and reversed the suppression of E2 on the LPS-induced apoptosis of DSCs (Figure 3B). This was also evidenced by the reduced mRNA and protein levels of the pro-survival proteins XIAP and BCL2 in the presence of GSK650394 compared to DSCs cultured without GSK650394 (Figure 3C, E and F). Moreover, this de-repression of LPS-initiated apoptosis caused by SGK1 inhibition was accompanied by the reduction of prolactin (PRL) gene expression (Figure 3D and G), which is a marker of decidual cell differentiation . Meanwhile, E2 incubation up-regulated, while GSK650394 down-regulated the levels of phosphorylated and total forkhead box O1 (FOXO1), and more importantly the phosphorylation rate of FOXO1 (Figure 3H and I), a transcriptional factor with pro-apoptotic potential as its transcriptional activities towards genes involved in cell cycle arrest and apoptosis . Taken together, these results suggest that E2-activated SGK1 negatively regulates TLR4-mediated apoptosis and suppression of cell viability of DSCs, which could result in pregnancy loss. E2 and SGK1 have both been shown to have their anti-inflammatory properties [34, 35]. More importantly, recent studies have revealed that SGK1 selectively differentiated TH1 and TH2 CD4+ T cells . Such observations are of great importance to embryo implantation and the subsequent maintenance of pregnancy, as the feto-maternal interface predominantly favors a TH2 type of intrauterine immunity . Therefore, we wondered whether E2-activated SGK1 affected the production of pro-inflammatory and TH1 cytokines in LPS-challenged DSCs as well as the transduction pathways involved. To this end, we investigated the production of pro-inflammatory and TH1 cytokines by LPS-challenged DSCs cultured with and without GSK650394 and/or the NF-κB inhibitor BAY11-7082, as NF-κB, which is a downstream target of SGK1, is crucial to the intrauterine inflammatory process . Our data demonstrated that incubation with E2 reversed TLR4-mediated suppression of IL-4 and IL-5 (TH2 cytokines) secretion by DSCs, and reduced secretion of the TH1 cytokine IFN-γ by DSCs (Figure 4A). SGK1 inhibition substantially decreased TH2 cytokine productions and increased the production of TH1 cytokines, and curbed the E2-mediated elevation of the IL-4/IFN-γ ratio in LPS-stimulated DSCs (Figure 4B). However, blockage of NF-κB activity by BAY11-7082 counteracted the SGK1-mediated enhanced TH1 cytokine production and reduced ratio of TH2/TH1 (Figure 4A and B). In addition, E2 pretreatment markedly rescued the low mRNA and protein levels of immune regulatory factor 4 (IRF4), which is implicated in the TH2 bias at the feto-maternal interface , whereas inhibition of SGK1 dramatically ablated this effect in LPS-treated DSCs (Figure 4C and D). These data indicate that SGK1 activation facilitates the switch of intrauterine immunity at the feto-maternal interface from the TH1 type to the TH2 type by impeding NF-κB, contributing to the maintenance of successful gestation. Low serum E2 concentration and down-regulation of decidual SGK1 correlate with early miscarriage. Serum E2 (A) and P4 (B) concentrations in normal pregnancy (n = 71) and early miscarriage (n = 88) during the first trimester of human pregnancy. E2, estradiol; P4, progesterone. (C) Real-time PCR analysis of SGK1 mRNA expression in the decidual tissues from normal pregnancy (n = 71) and miscarriage (n = 88) during early pregnancy. (D) Western blot analysis (left) and quantification (right) of phosphorylated (p)- and total (t)- SGK1 levels relative to β-actin, and phosphorylated-to-total SGK1 protein in decidual tissue in early miscarriage and normal pregnancy (n = 10). Representative histological analysis of decidual tissue from early normal pregnancy (n = 16) and miscarriage (n = 28) stained with hematoxylin and eosin (E) or immunohistochemical staining of SGK1 expression (F); original magnification: × 200; scale bar: 50 μm. (G) Decidual tissue from early normal pregnancy (n = 4) and miscarriage (n = 4) were double-stained with anti-human SGK1 antibody (green) and anti-human vimentin (red) antibody using laser scanning confocal microscopy. Nuclei are visualized by staining with DAPI (blue). Yellow-orange color represents the localization of SGK1 (green) in decidual stromal cells (red). Final magnification: × 1000. Data are represented as arithmetic means ± SEM, **P < 0.01, ***P < 0.001. Activation of TLR4 signaling leads to the intensified apoptosis of DSCs, and E2 activates SGK1 in LPS-stimulated DSCs. (A) Viability of DSCs treated without (control) or with LPS was determined by the MTT assay. (B) Apoptosis of DSCs treated without (control) or with the TLR-4 ligand LPS was analyzed by flow cytometry based on PI staining and annexin expression. (C) mRNA expression levels of the pro-survival genes BCL2 and XIAP in DSCs treated with or without LPS. (D) Immunoblot (left) and densitometric analysis (right) of BCL2 protein level in DSCs treated with or without LPS. (E) Immunoblot (left) and densitometry analysis (right) of XIAP protein level in DSCs treated with or without LPS. (F) DSCs were confirmed by immunofluorescence staining and confocal microscopy to detect vimentin-positive (upper panel), cytokeratin 7-negative (lower panel) cells. Nuclei were stained by DAPI (blue). Magnification: × 1000. (G) Representative Western blot analysis (top) and densitometric quantification (bottom) of the arithmetic mean (SEM) ratio of phosphorylated-to-total SGK1 protein upon E2 activation in the presence and absence of LY294002 in LPS-stimulated DSCs. Control group, phenol red-free RPMI-1640 media; LPS group, 10 ng/mL LPS; LPS+E2 group, 10 ng/mL LPS + 10 nM E2; LPS+E2+LY294002 group, 10 ng/mL LPS + 10 nM E2 + 25 mM LY294002. Data are represented as arithmetic means ± SEM for 3-6 individual DSCs from early normal pregnancy. *P < 0.05, **P < 0.01, ***P < 0.001, compared with control group; ∆∆∆P < 0.001, compared with LPS group; ###P < 0.001, compared with LPS+E2 group. E2-stimulated activation of SGK1 attenuates TLR4-mediated apoptosis of DSCs. (A) Relative efficiencies of DSC growth were assessed with the MTT assay. (B) TLR-4-triggered apoptosis of E2-pretreated DSCs in the presence or absence of SGK1 inhibitor GSK650394 was determined by flow cytometry based on PI staining and annexin expression. Transcript levels the of anti-apoptotic genes BCL2 and XIAP (C), and the decidual marker gene PRL (D) in LPS-stimulated DSCs incubated with E2 with or without GSK650394. Protein levels of BCL2 (E), XIAP (F) and PRL (G) were analyzed by immunoblotting in LPS-stimulated DSCs incubated with E2 with or without GSK650394. (H) Western blot analysis of cell lysates of LPS-stimulated DSCs pretreated with E2 with or without GSK650394. Blots were probed with antibodies to total-FOXO1 (t-FOXO1), phosphorylated-FOXO1 (p-FOXO1) and β-actin as a loading control. (I) Densitometric quantification of phosphorylated- and total FOXO1 to β-actin (left), and mean (SEM) ratio of phosphorylated-to-total protein for FOXO1 (right). Control group, phenol red-free RPMI-1640 media; LPS group, 10 ng/mL LPS; LPS+E2 group, 10 ng/mL LPS + 10 nM E2; LPS+E2+GSK650394 group, 10 ng/mL LPS + 10 nM E2 + 10 μM GSK650394. Data are represented as arithmetic means ± SEM for 3 individual DSCs from early normal pregnancy. *P < 0.05, **P < 0.01, ***P < 0.001, compared with control group; ∆P < 0.05, ∆∆P < 0.01, ∆∆∆P < 0.001, compared with LPS group; #P < 0.05, ##P < 0.01, ###P < 0.001, compared with LPS+E2 group. To further investigate the beneficial roles of E2-sensitive activation of SGK1 in early pregnancy, we analyzed the secretions of pro-inflammatory cytokines by DSCs. E2 pretreatment counteracted the LPS-stimulated increase in the TNF-α, IL-6 and IL12p70 production in DSCs, whereas SGK1 inhibition reversed this attenuation (Figure 4E). 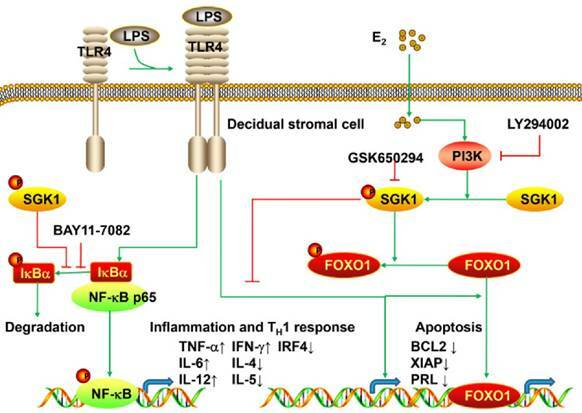 Moreover, NF-κB inhibition offset the effects of SGK1 inhibition on the productions of pro-inflammatory cytokines by LPS-stimulated DSCs (Figure 4E). Our findings suggest that E2-sensitive activation of SGK1 in TLR-4-triggered DSCs down-regulates generation of the pro-inflammatory cytokines that might lead to pregnancy loss, probably through NF-κB inhibition. We demonstrated that NF-κB blockage abolished the reduction of pro-inflammatory TH1 cytokines secretions by SGK1 inhibition in LPS-stimulated DSCs. We investigated the effect of E2-activated SGK1 on NF-κB activities in LPS-treated DSCs to determine the mechanisms responsible for these effects. Our data demonstrated that LPS treatment up-regulated the phosphorylated- and total protein levels, and the phosphorylation rate of inhibitor of nuclear factor kappa-B kinase subunit alpha (IκBα, Figure 5A and B), which controls the nuclear migration of NF-κB. Although the total protein levels of NF-κB p65 were unchanged, the phosphorylated (p)-NF-κB p65 and phosphorylation rate of NF-κB p65 were increased by LPS stimulation (Figure 5C and D). We next examined NF-κB p65 protein levels in the nucleus and cytoplasm. LPS-stimulation transported NF-κB p65 from the cytosol to the nucleus (Figure 5E and F). These observations indicate that LPS enhanced NF-κB activity by promoting its nuclear translocation. However, E2 pretreatment reversed these effects of LPS on DSCs, while SGK1 inhibition withdrew the influence of E2 incubation exerted on LPS-stimulated DSCs (Figure 5A-F). 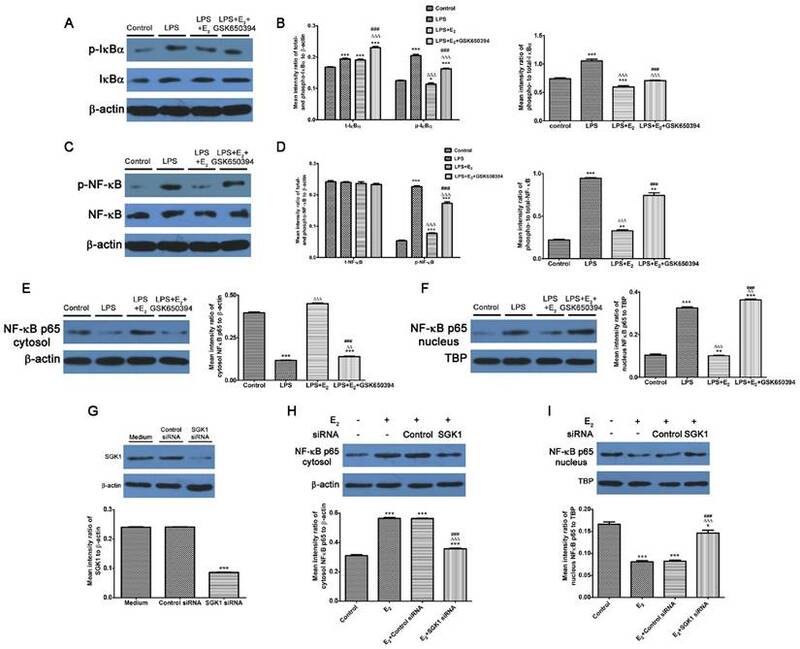 In addition, siRNA-mediated SGK1 knockdown confirmed its negative regulation of NF-κB activation by promoting NF-κB nuclear translocation (Figure 5G-I). These data suggest that E2-activated SGK1 hindered nuclear translocation and the subsequent activation of NF-κB, and is therefore involved in the TH2 polarization of the intrauterine microenvironment that is beneficial to the maintenance of gestation. E2-sensitive activation of SGK1 relieves the LPS-aggravated inflammatory responses of DSCs and drives TH2 shift through NF-κB suppression. (A) IL-4, IL-5, and IFN-γ secretion in supernatants of LPS-stimulated DSCs pretreated with E2 with or without GSK650394 and/or BAY11-7082. E2, estradiol; GSK, SGK1 inhibitor GSK650394; BAY, NF-κB inhibitor BAY11-7082. (B) The IL-4/IFN-γ ratio (TH2/TH1 cytokines) was obtained from data represented in 4A. mRNA (C) and protein (D) levels of IFR4 in LPS-stimulated DSCs pretreated with E2 in the presence or absence of GSK650394 and/or BAY11-7082. (E) Generation of pro-inflammatory cytokines TNF-α, IL-6 and IL-12p70 in LPS-stimulated DSCs pretreated with E2 in the presence or absence of GSK650394 and/or BAY11-7082. Control group, phenol red-free RPMI-1640 media; LPS group, 10 ng/mL LPS; LPS+E2 group, 10 ng/mL LPS + 10 nM E2; LPS+E2+GSK group, 10 ng/mL LPS + 10 nM E2 + 10 μM GSK650394; LPS+E2+GSK+BAY group, 10 ng/mL LPS + 10 nM E2 + 10 μM GSK650394 + 30 μM BAY 11-7082. Data are represented as arithmetic means ± SEM for 3-6 independent samples. **P < 0.01, ***P < 0.001, compared with control group; ∆P < 0.05, ∆∆P < 0.01, ∆∆∆P < 0.001, compared with LPS group; ##P < 0.01, ###P < 0.001, compared with LPS+E2 group; +P < 0.05, ++P < 0.05, +++P < 0.001, compared with LPS+E2+GSK650394 group. Inhibition of E2-activated SGK1 increases the phosphorylation and nuclear translocation of NF-κB in LPS-stimulated DSCs. Western blot analysis of LPS-stimulated DSC lysates pretreated with E2 in the presence or absence of GSK650394 (A-F). (A) Blots were probed for phosphorylated IκBα (p-IκBα), total IκBα (t-IκBα) and total β-actin. (B) Densitometric quantifications of p-IκBα and t-IκBα to β-actin (left), and mean (SEM) ratio of phosphorylated-to-total IκBα protein (right). (C) Bolts were probed with phosphorylated NFκB (p-NF-κB), total NF-κB (t-NF-κB), and total β-actin. (D) Densitometric quantifications of p-NF-κB and t-NF-κB (left) to β-actin, and mean (SEM) ratio of phosphorylated-to-total NF-κB protein (right). Western blot analysis of cytosol (E) and nucleus (F) NF-κB p65 and β-actin and nuclear TBP served as the loading controls. Western blot analysis of SGK1 (G), cytosol (H) and nucleus (I) NF-κB p65 of DSCs pretreated with SGK1-specific and non-targeting negative control siRNA. Control group, phenol red-free RPMI-1640 media; LPS group, 10 ng/mL LPS; LPS+E2 group, 10 ng/mL LPS + 10 nM E2; LPS+E2+GSK650394 group, 10 ng/mL LPS + 10 nM E2 + 10 μM GSK650394. Data are represented as arithmetic means ± SEM for 3 independent samples. **P < 0.01, ***P < 0.001, compared with control group or medium group; ∆∆P < 0.01, ∆∆∆P < 0.001, compared with LPS group or E2 group; ###P < 0.001, compared with LPS+E2 group or E2+control siRNA group. The present study is the first to provide evidence that serum E2 concentration regulates decidual SGK1 in the first trimester of gestation. Our findings suggested that E2-activated SGK1 may be important in maintaining normal gestation by attenuating TLR4-triggered pro-apoptotic and pro-inflammatory TH1 immune responses in the intrauterine microenvironment (Figure 6). Our data showed that the serum E2 concentration was lower in women suffering from spontaneous miscarriage than in women with normal pregnancies. E2 is a primary endocrine steroid hormone that plays an essential role throughout pregnancy and is involved in embryo implantation, fetal development, gestation maintenance and regulation of reproduction . We found that this trend of serum E2 concentration and down-regulation of the decidual SGK1 in early miscarriage were correlated. Aberrant SGK1 expression was found in decidual tissue from compromised pregnancies, implying that aberrant SGK1 expression in decidual tissue may be related with spontaneous miscarriage . Consistent with previous studies, immunohistochemical analyses revealed that decidual SGK1 was localized to the decidualized endometrial stromal compartment, which is considered to be a maternal prerequisite for the invasion of trophoblasts and subsequent placenta formation [20, 32, 40-42]. Decidual SGK1 transcript and protein levels were both decreased in spontaneous miscarriage than in normal pregnancy. Moreover, the phosphorylation of decidual SGK1, which denotes activation of the kinase, was lower in early miscarriage than in normal pregnancy. Therefore, E2 and SGK1 may be correlated with early spontaneous miscarriage. The decidua serves as a physical barrier between the maternal tissue and the invading syncytio-trophoblasts . It is the first line of protection against external bacteria and viruses that may provoke a substantial threat to both fetus and mother . DSCs are especially abundant in human decidua, and thus represent the major cellular component of decidua during the first trimester of gestation . In addition to their traditional supportive and metabolic role in pregnancy, DSCs are indispensable for the establishment and the maintenance of gestation by balancing the expression of inflammatory chemokines and cytokines to prevent the immune rejection of the semi-allogeneic conceptus, while avoiding an excessive reaction to infectious pathogens . Indeed, DSCs have been reported to down-regulate the inflammatory cytokine profile of the intrauterine microenvironment, contributing to immune tolerance at the feto-maternal interface . Correspondingly, increased secretion of pro-inflammatory cytokines by DSCs has been implicated in women suffering from spontaneous miscarriage . Due to their immune-modulating and anti-inflammatory properties, we used DSCs to explore the possible mechanism of early spontaneous miscarriage in this study. There is an increasing body of evidence indicating that a pro-inflammatory cytokine profile in the intrauterine microenvironment may predispose immune maladaptation, which is observed in early spontaneous miscarriages, in which TLR4 plays a pivotal role . TLR4 belongs to the PRRs family that recognizes pathogen-related agents and triggers anti-pathogen immune responses. Excessive TLR4 activation in the decidua and later on in the placenta contributes to spontaneous miscarriage and preeclampsia [12, 27]. Therefore, we investigated how TLR4 signaling affects DSCs to further explore its effects on the maintenance of gestation. LPS was found to enhance apoptosis and increase the production of pro-inflammatory cytokines IL-6, IL-12p70 and TNF-α as well as the TH1 cytokine IFN-γ in DSCs. LPS/TLR4 stimulation also down-regulated the mRNA and protein levels of XIAP and BCL2, which are pro-survival genes. 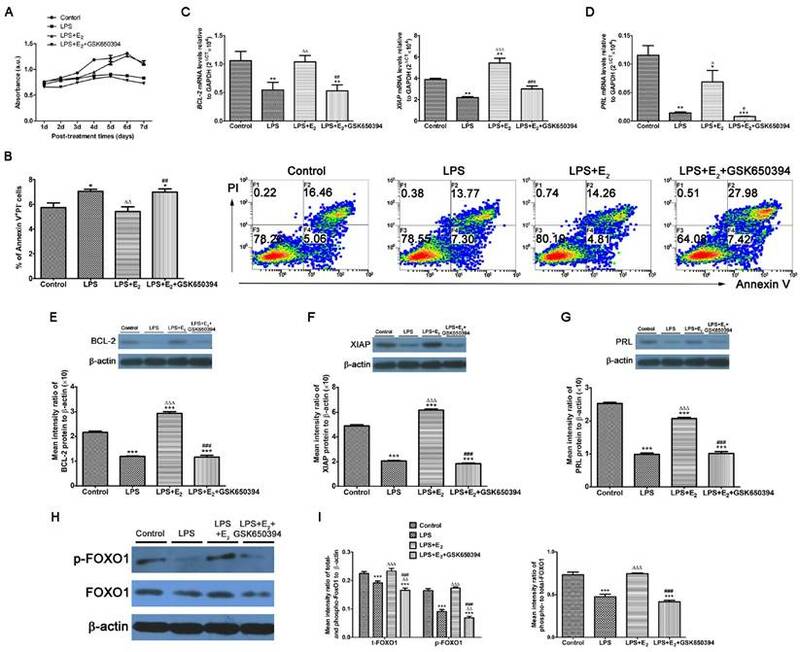 Therefore, uncontrolled LPS-induced activation of TLR4 signaling elicited apoptosis and a shift toward the TH1 profile at the feto-maternal interface, which might contribute to spontaneous miscarriage. Working model of E2-activated SGK1 involvement in negative regulation of TLR-4-mediated apoptosis and pro-inflammatory TH1 immune responses at the feto-maternal interface. E2-activated SGK1 via the PI3K signaling pathway promoted cell viability and suppressed LPS-induced apoptosis of DSCs by up-regulating the expressions of anti-apoptotic genes, and attenuating pro-apoptotic FOXO1 activation. E2-sensitive activation of SGK1 down-regulates TLR4-mediated NF-κB activation, leading to reduced production of pro-inflammatory cytokines and promoting TH2 shift at the feto-maternal interface, which is beneficial to successful gestation. 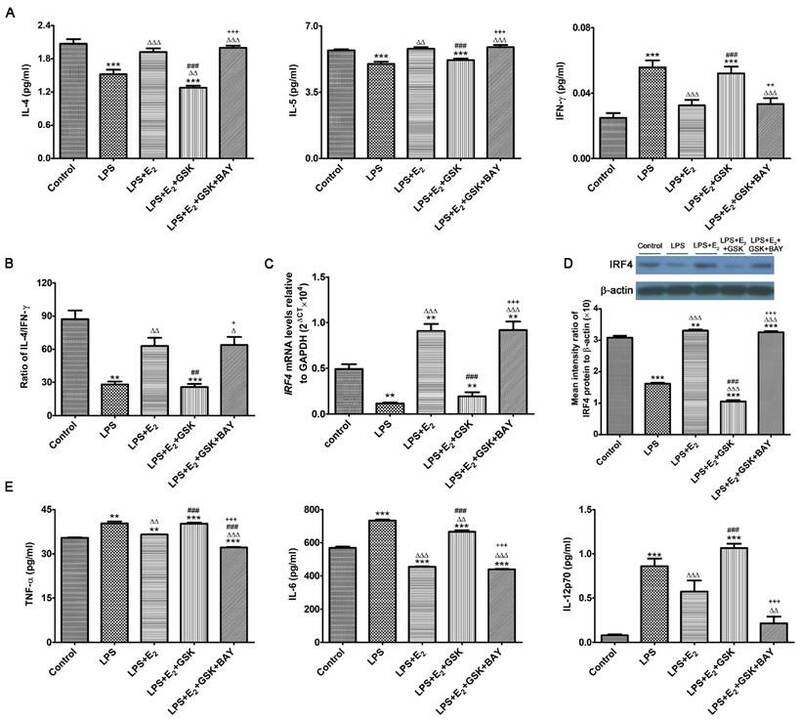 E2 accumulation has been shown to completely block LPS-induced expression of TLR4 and TNF-α in bovine oviduct epithelial cells in vitro . E2 has also been shown to sustain the survival of BRCA1-deficient mammary epithelial cells via the PI3K/protein kinase B (PKB) pathway . In our study, we showed that E2 pretreatment activated SGK1, its downstream target, via the PI3K signaling pathway in LPS-stimulated DSCs, while the PI3K inhibitor LY294002 markedly reversed the E2-induced phosphorylation of SGK1. SGK1 resembles PKB/AKT, a known kinase heavily implicated in neogenesis [46, 47], and it has been demonstrated as a critical regulator in cancer cells, participating in both apoptosis and survival [48-50]. Thus, SGK1 phosphorylation could improve cell survival and up-regulate several survival-associated transcription factors, ultimately inhibiting cell apoptosis. A deficiency of SGK1 could impair this cell survival and induce cell apoptosis . We showed that E2 pretreatment attenuated LPS-triggered apoptosis in DSCs, whereas blockage of SGK1 reciprocally neutralized this effect. Likewise, SGK1 inhibition considerably abrogated the E2-stimulated expressions of pro-survival genes XIAP and BCL2 in DSCs. Meanwhile, the phosphorylated pro-apoptotic FOXO1, which suppressed its transcriptional activity, was elevated by E2-stimulated activation of SGK1 in LPS-treated DSCs. SGK1 can phosphorylate FOXO1 and abrogate its transcriptional activities, resulting in enhanced cell differentiation . Furthermore, our data demonstrated that E2-sensitive SGK1 activation promoted the cell viability of DSCs, accompanied by increased mRNA and protein levels of PRL, a known decidual marker gene. This is contrary to a previous study reporting attenuated PRL expression by SGK1 , probably due to different study settings. Therefore, we speculate that E2 suppressed LPS/TLR4-induced apoptosis and promoted cell viability of DSCs probably via the PI3K-SGK1 signaling pathway. E2 plays multiple roles in immunomodulation due to its distinct effects on different immune cell types . Paradoxically, E2 is known to exert both pro- and anti-inflammatory effects. Thus, E2 has been indicated to exert control over various immune and inflammatory responses . The effects of E2 on inflammatory machinery have been well described ; therefore, we determined whether activated SGK1 is involved in the modulation of TLR4-mediated pro-inflammatory cytokine production at the maternal-fetal interface. E2 supplementation vigorously diminished the TLR4-induced pro-inflammatory immune responses in DSCs, as evidenced by the decreased secretions of IL-6, IL-12p70 and TNF-α, while SGK1 inhibition substantially ablated this down-regulation. Therefore, our data suggest that SGK1 activation by E2 attenuates the pro-inflammatory responses that adversely affect gestation maintenance at the feto-maternal interface. An intrauterine microenvironment with predominant TH2-type cytokines is considered ideal during pregnancy . In contrast, dominance of the TH1-type immune response is generally associated with embryonic rejection. Therefore, the balance of TH2/TH1 cytokines is critical to the maintenance of gestation. Here, LPS treatment suppressed the induction of TH2 cytokines. E2 supplementation considerably enhanced the generation of TH2 cytokines such as IL-4 and IL-5, while decreasing the secretion of the TH1 cytokine IFN-γ in LPS-stimulated DSCs. In agreement with these findings, E2-activated SGK1 increased the ratio of IL-4/INF-γ (TH2/TH1 cytokines). Conversely, SGK1 inhibition abolished the E2-induced increase of TH2 cytokines in LPS-treated DSCs, and consequently reduced the ratio of TH2/TH1 cytokines. In addition, E2 pretreatment reversed the inhibitory effect of LPS/TLR4 on the mRNA and protein levels of IRF4, a gene implicated in TH2 polarization at the maternal-fetal interface . Inhibition of SGK1 strikingly reduced the IRF4 mRNA and protein levels in LPS-treated DSCs. Recent studies have identified SGK1 as a selective regulator for the differentiation of TH1 and TH2 CD4+ T cells . SGK1 was found to facilitate TH2 differentiation by phosphorylating Nedd4-2 to inhibit degradation of the transcription factor JunB under the TH2-polarizing conditions, while suppressing the generation of TH1 cytokines . These findings are of particular importance to the maintenance of gestation, as the feto-maternal interface primarily favors a TH2 shift . Considering the pivotal roles of SGK1 in immunomodulation, we explored the intracellular cascade of the E2-stimulated TH2 cytokine induction in LPS-treated DSCs. Our data demonstrated that E2-sensitive activation of SGK1 negatively regulated LPS/TLR4-triggered pro-inflammatory TH1 immune reactions by suppressing NF-κB activity. Previous reports have described that SGK1 directly associates with and phosphorylates the inhibitor of nuclear factor kappa-B kinase subunit beta (IKKβ), thus increasing nuclear factor kappa-B kinase inhibitor (IκB) phosphorylation and subsequent degradation, leading to p65 translocation and NF-κB DNA binding [55, 56]. Alternatively, SGK1 could indirectly activate IKKβ by phosphorylating the inhibitor of nuclear factor kappa-B kinase subunit alpha (IKKα) , leading to activation of NF-κB pathway [57, 58]. However, in the present study, E2-activated SGK1 suppressed the NF-κB-driven transcriptional activities, while inhibiting SGK1 blocked the protective effect of E2 and the TH2 shift by activating NF-κB in LPS-stimulated DSCs. A recent study showed that SGK1 down-regulates NF-κB-dependent transcription via blocking TGFβ-activated kinase 1 (TAK1) activity, resulting in reduced TLR-mediated inflammation and tempered endotoxin-driven organ failure . Hence, we proposed that E2 incubation activates decidual SGK1 by the PI3K signaling pathway, compromising LPS/TLR4-driven apoptosis and pro-inflammatory immune responses in the intrauterine milieu by inhibiting TLR4-initiated NF-κB activation. The precise mechanism by which E2-triggered SGK1 activation inhibits TLR4 signaling and NF-κB activation at the feto-maternal interface requires further investigation. In conclusion, this study highlights that E2-activated SGK1 negatively regulates the LPS/TLR-4-triggered apoptosis and pro-inflammatory TH1 immune responses, illustrating that E2-activated SGK1 plays a critical role in immune modulation during early gestation via DSCs. The present study provides insight into the mechanism by which down-regulation of decidual SGK1 by deregulated E2 contributes to unexplained spontaneous miscarriage. E2 supplementation has an impact on reproductive outcome, and benefits patients undergoing assisted reproductive technologies . As discussed in the present study, E2 protects against pro-inflammatory immune responses at the feto-maternal interface, and represents a positive treatment for early threatened miscarriage. These findings can pave the way to new interventions targeting serum E2 and decidual SGK1 for successful reproductive process. Approaches to intensify E2-sensitive SGK1 activation could be applied to manage early spontaneous miscarriage caused by extensive inflammatory immune responses. The ethical approval for this study was granted by the Ethics Committee for Research on Human Subjects of Zhejiang University, China (no: 20120019, 20130044) and Medical Ethics Committee of Hangzhou Hospital of Traditional Chinese Medicine, Zhejiang, China (no: 2014LL076, 2014LL077). All study participants recruited (from March 2012 to March 2015) provided their written informed consents prior to enrollment. All human experiments were carried out in accordance with the approved guidelines and regulations. Human decidua were obtained during the elective first trimester (gestational age 6-12 weeks) terminations from clinically normal pregnancies (voluntary termination of pregnancy, n=71) and miscarriages (diagnosed as unexplained spontaneous miscarriages excluding chromosomal abnormalities, uterine anatomic defections, endocrine problems, infections or women who were not able to sign informed consents, n=88). The gestational ages and intrauterine pregnancies were confirmed by the date of last menstrual period, ultrasound scan and serum human chorionic gonadotropin (hCG). Supplementary Table S1 presents the comparative demographic characteristics of the studied women with normal pregnancies or miscarriages. Decidual tissues were obtained from the women with miscarriages soon after they were diagnosed. Decidual tissues were collected in the operation theater and rinsed twice with PBS containing antibodies to remove most of the remaining blood clots. Then, decidual tissues were collected in ice-cold Dulbecco's modified Eagle's medium-F12 (DMEM/F12; Gibco, USA). Some of the tissues were fixed in paraffin and used for histochemical analysis. Fresh decidual tissues were finely minced in PBS, digested using collagenase IV (Sigma-Aldrich, USA), and isolated via discontinuous Percoll gradient centrifugation as reported previously in order to obtain DSCs . The primary culture of DSCs was confirmed by staining for human vimentin (ab92547, Abcam, UK) and human ctyokeratin7 (CK7, ab76126, Abcam, UK). Total RNA from decidual tissues and DSCs were extracted with Trizol (Invitrogen) and reverse transcribed with SYBR PrimeScript RT-PCR Kit (TaKaRa). qRT-PCR was performed using the SYBR Premix Ex Taq (TaKaRa) on an ABI 7900 thermocycler according to the manufacturer's protocol (Takara). Briefly, qPT-PCR was carried out in a 20 μL reaction system containing 0.8 μL primers (10 μM), 10 μL SYBR Premix Ex Taq (2×), 0.4 μL ROX reference dye, and 2 μL complementary DNA (cDNA) sample (< 100 ng). These measurements were performed in triplicate. The primer sequences are listed in Supplementary Table S2. The housekeeping gene GAPDH served as internal controls for analyzing the relative expression levels of the genes. All primers were synthesized by the Shanghai Sangon Corporation (Shanghai, China). Data were evaluated by 2-ΔCT = 2-(CT, sample - CT, calibrator) [61, 62]. Cellular cytoplasmic and nuclear fractions of DSCs were isolated using NE-PER™ Nuclear and Cytoplasmic Extraction Reagents (78833, Thermo Fisher Scientific, USA) according to the manufacturer's instructions. The proteins were separated by sodium dodecyl sulfate-polyacrylamide gel electrophoresis (SDS-PAGE) as described previously . Immunoblotting was performed with the primary antibodies against SGK1 (1:800, sc-28338, Santa Cruz, USA), phospho (p)-SGK1 (1:800, sc-16744, Santa Cruz, USA), IκBα antibody (1:500, sc-847, Santa Cruz, USA), p-IκBα (1:500, sc-8404, Santa Cruz, USA), NF-κB p65 (1:1000; #3034, Cell Signaling Technologies, USA), p-NF-κB p65 (1:1000, #3033, Cell Signaling Technologies, USA), FOXO1 (1:1000, #2880, Cell Signaling Technologies, USA), p-FOXO1 (1:500, #2486, Cell Signaling Technologies, USA), BCL-2 (1:500, ab196495, Abcam, UK), XIAP (1:200, ab86229, Abcam, UK), PRL (1:200, ab47150, Abcam, UK), IRF4 (MUM1, 1:2000, ab133298, Abcam, UK), and progesterone receptor (PGR, 1:1000, ab32085, Abcam, UK). For immunofluorescence analysis, horseradish peroxidase (HRP)-conjugated goat anti-mouse IgG (1:5000, 31160, Thermo Pierce) and HRP-conjugated goat anti-rabbit IgG (1:5000, 31210, Thermo Pierce) were used as secondary antibodies. The band intensity was quantified using β-actin (1:1500, sc-47778, Santa Cruz, USA) or anti-TATA binding protein TBP antibody (1:5000, ab197874, Abcam, UK) as the standard and assessed by Bandscan 5.0 software. Decidual tissues (obtained from 28 miscarriages and 16 normal pregnancies) were fixed in 4% paraformaldehyde (PFA), dehydrated, and embedded in paraffin. Then, 3-4 µm serial sections were deparaffinized, and then rehydrated in a graded series of alcohol, followed by staining with hematoxylin and eosin. For immunohistochemical staining, serial slides of 3- to 4-μm sections coated with poly-L-lysine were prepared. The slides were rinsed with PBS, and the endogenous peroxidase activity was quenched with H2O2. The slides were incubated with 10% fetal bovine serum and then with primary antibodies against SGK1 overnight at 4 °C. The slides were then rinsed thrice with PBS for 5 min each time, and incubated with HRP-conjugated secondary antibodies for 1 h at 37 °C. To confirm the specificity of SGK1 antibodies, negative controls were performed in an identical manner but without the primary antibody. Photographs were taken with an Olympus BX20 microscope (Japan). For immunofluorescence staining, slides containing decidual tissue and DSCs were incubated with the indicated primary antibodies: anti-SGK1 antibody (1:100, ab32374, Abcam, UK), anti-vimentin antibody (1:250, ab8069, Abcam, UK), and anti-ctyokeratin7 antibody (1:250, ab76126, Abcam, UK) at 4 °C overnight. Fluorescein isothiocyanate (FITC)-conjugated Affinipure goat anti-rabbit IgG (1:60, ZF-0311, ZSGB-BIO, China) and rhodamine (TRITC)-conjugated Affinipure goat anti-mouse IgG (1:60, ZF-0313, ZSGB-BIO, China) secondary antibodies were incubated for an additional 1 h at 37 °C in the dark, and then washed thrice in PBS. The nuclei were counterstained with 4ʹ,6-diamidino-2-phenylindole (DAPI). Cells were observed using a fluorescence confocal microscope (FV1200, Olympus, Japan). Images were obtained using FV10-ASW 4.2 confocal laser. The serum E2 and P4 concentrations were measured using electrochemiluminescence immunoassay by Roche Modular Analytics Cobas e601 (Roche Diagnostics, Mannheim, Germany) with Roche Cobas reagents and competitive chemiluminescent enzyme immunoassay in Immulite® 2000 (Siemens Medical Solutions Diagnostic, Germany). The laboratories regularly performed calibration verifiers during the study period. For E2, the intra- and inter-assay coefficients of variation were 5.00-7.14%, and 3.48-7.61%, respectively. For P4, the intra- and inter-assay coefficients of variances were 3.75-4.84%, and 0.27-3.30%, respectively. Freshly isolated DSCs were plated in 96-well microplates and grown in phenol red-free RPMI-1640 media (90022-500, Solarbio) supplemented with 10% charcoal-stripped/filtered fetal bovine serum (FBS, 04-201-1A, Biological Industries) and 1% streptomycin-penicillin (CORNING, 30-002-CIa) at 37 °C in a humidified 5% CO2 air atmosphere. LPS derived from Escherichia coli 0111:B4 was used to treat DSCs. DSCs were serially cultured, and cells from passage (P)2 and P3 were used in the experiment. DSCs divided into eleven treatment groups and were treated with the following stimulators with or without inhibitors: (1) media control group: phenol red-free RPMI-1640 media; (2) LPS group: 10 ng/mL TLR4 ligand LPS (L4391, Sigma-Aldrich); (3) E2 group: 10 ng/mL LPS + 10 nM E2 (E2758, Sigma-Aldrich); (4) LY294002 group: 10 ng/mL LPS + 10 nM E2 + 25 mM PI3K signaling pathway inhibitor LY294002 (9901S, Cell Signaling Technology); (5) GSK650394 group: 10 ng/mL LPS + 10 nM E2 + 10 μM SGK1 inhibitor GSK650394 (S7209, Selleck); (6) BAY 11-7082 group: 10 ng/mL LPS + 10 nM E2 + 10 μM GSK650394 + 30 μM NF-κB inhibitor BAY 11-7082 (S2913, Selleck); (7) P4 group: 10 nM P4 (Cat. No. 2835, Tocris); (8) LPS+ P4 group: 10 ng/mL LPS + 10 nM P4; (9) ICI 182,780 group: 10 ng/mL LPS + 10 nM E2 + 1 μM ER antagonist ICI 182,780 (Cat. No. 1047, Tocris); (10) PHTPP group: 10 ng/mL LPS + 10 nM E2 + 1 μM ERα antagonist PHTPP (Cat. No. 2662, Tocris); (11) MPP group: 10 ng/mL LPS + 10 nM E2 + 1 μM ERβ antagonist MPP (Cat. No. 1991, Tocris) for 24 h.
Cell viability and proliferation were determined using 3-(4,5-dimethylthiazol-2-yl)-2,5-diphenyltetrazolium bromide (MTT, Multi sciences, AP101-30) according to the manufacturer's instructions. Briefly, DSCs were resuspended in DMEM/F12 containing 10% bovine serum and cultured in 24-well plates overnight. The medium was removed after 24 h of culture. DSCs were incubated with stimulators and inhibitors as described above. Then, 40 μl MTT reagent was added to each well of 24-well microplates and the plates were incubated for an additional 4 h at 37 °C. Then, the medium was decanted, and the absorbance of the treated cells was measured at an optical density of 492nm within 1h. The DSCs were expressed as percentage viability relative to the untreated control cells, which were assumed to be 100%. Cell proliferation was determined 1, 2, 3, 4, 5, 6 and 7 days after treatments. Apoptosis was detected using flow cytometry according to the instruction manual of the Annexin-V/FITC kit (Multi sciences, 70-AP101-100) and the manufacturer's protocol. In brief, 5 × 105 DSCs were collected and rinsed twice with cold sterile PBS. Then, DSCs were resuspended in 500 mL of Annexin V binding buffer, and treated with 5 mL of Annexin V-FITC and 5 mL of propidium iodide (PI). Then, the DSCs were gently vortexed and further incubated for 10 min in the dark at room temperature. Within 1 h, DSCs were analyzed using FACSVerse (BD Biosciences, Rockville, MD, USA). Cell culture supernatants were collected after stimulation and sample treatments. The production of interferon gamma (IFN-γ), tumor necrosis factor-α (TNF-α), interleukin 4 (IL-4), interleukin 5 (IL-5), interleukin 6 (IL-6) and interleukin 12 (IL-12) p70 was measured using Luminex technology with the microsphere-based ProcartaPlex® human antibody panel (EPX060-10009-901, eBioscience/Affymetrix, Frankfurt am Main, Hessen, Germany). The untreated and treated samples were run on the same plate. The resultant data were analyzed on Luminex test equipment (Bio-Plex®System, Bio-Rad, Germany) according to the manufacturer's protocol. Human SGK1 siRNA (sense: GUCCUUCUCAGCAAAUCAAdTdT; antisense: UUGAUUUGCUGAGAAGGACdTdT), human ESR2 siRNA (sense: CUCACCAUCUAGCCUUAAUdTdT; antisense: AUUAAGGCUAGAUGGUGAGdTdT) and silencer FAM-labeled negative siRNAs were purchased from Biomics, and diluted in Opti-MEM Reduced Serum Medium (Life Technologies, Inc.) with Lipofectamine RNAiMAX Reagent (Life Technologies, siRNA:RNAiMAX ratio 1:1). Primary DSCs were plated in the above serum-free medium to achieve 50-60% confluence, and then the DSCs were transfected with 50 nM SGK1 siRNA and 100 nM ESR2 siRNA or non-targeting control siRNA. After transfection for 48 h, the DSCs were treated with E2 for another 24 h and harvested for Western blot analysis. Statistical Package for SocialSciences 16.0 (SPSS Inc., Chicago, IL, USA) was used for the statistical analysis. One-factor analysis of variance (one-way ANOVA) was used assess the differences between groups with least significant differences and Student-Neuman-Keul post hoc testing when the variances were homogeneous or with Tamhane's T2 post hoc comparison in case of unequal variances. The Student's t-test was employed to compare the difference between two groups. All values are presented as means obtained from triplicates, and the data from in vitro experiments are representatives of three independent experiments. Data are presented as the arithmetic mean ± SEM. A P value of < 0.05 was considered statistically significant. AGC: protein kinase A/protein kinase G/protein kinase C; BCL: 2B-cell CLL/lymphoma 2; BMI: body mass index; BOEC: bovine oviduct epithelial cell; DECs: decidual epithelial cells; DSCs: decidual stromal cells; E2: estradiol; ER: estrogen receptor; ESCs: endometrial stromal cells; FOXO1: forkhead box O1; hCG: human chorionic gonadotropin; IFN-γ: interferon gamma; IκB: nuclear factor kappa-B kinase inhibitor; IKKβ: nuclear factor kappa-B kinase subunit beta; IL-4: interleukin 4; IL-5: interleukin 5; IL-6: interleukin 6; IL-12: interleukin 12; IRF4: immune regulatory factor 4; LPS: lipopolysaccharide; MECs: mammary epithelial cells; miR: microRNA; NF-κB: nuclear factor-kappa B; P4: progesterone; PGR: progesterone receptor; PKB: protein kinase B; PI3K: phosphoinositide 3-kinase; PRL: prolactin; PRRs: pattern recognition receptors; RPL: recurrent pregnancy loss; SGK1: serum-glucocorticoid regulated kinase 1; TAK1: TGFβ-activated kinase 1; TLRs: Toll-like receptors; TNF-α: tumor necrosis factor-α, XIAP: X-linked inhibitor of apoptosis protein. This work was supported by grants from the National Basic Research Program of China (no. 2014CB943302; no. 2012CB944901); National Natural Science Foundation of China (no. 81571500; no.81370760; no 81200475); Youth Fund of National Natural Science Foundation of China (no. 81501321); Natural Science Foundation of Zhejiang Province (no. LZ13H040001; no. LZ15H040001; no. Y2100822; no. LY14H040009; no. LY17H040006); Medical Scientific Research Program of Zhejiang Province (no. 2014KYA269; no. 2016KYA120); Health Science and Technology Program of Hangzhou (no. 2014A54); and Chinese Medicine Research Program of Zhejiang Province (no. 2015ZA159). Y.-Y.L. and F.J. conceived and designed the study; Y.-Y.L. and S.-S.H. collected decidual tissue; Y.-Y.L, M.-H.H., Q.-J.W., M.Y. and N.W. conducted the experiments; Y.-Y.L. F.L. and L.-Y.W. analyzed and interpreted the results; Y.-Y.L. wrote the manuscript and drew all the images; L.-J.L. and X.-Y.X provided critical suggestions to the study; F.J. supervised the study and revised the manuscript. All authors reviewed the manuscript. Corresponding author: Dr. Fan Jin Ph.D., M.D. Department of Reproductive Endocrinology, Key Laboratory of Reproductive Genetics, Ministry of Education, Key Laboratory of Women's Reproductive Health of Zhejiang Province, Women's Hospital, School of Medicine, Zhejiang University, Hangzhou 310006, China. Tel: +86 571 87013891; Fax: +86 571 87061878; E-mail: jinfanedu.cn.